Richard Sherman, Marshawn Lynch, and the rest of the Seahawks are the best thing going for the NFL right now. They're smart and confident enough to speak out (or in Lynch's case act out) against some of the many shortcomings of their league. Weird thing to see on this site and sort of petty. I think it's an important lesson about competing with class and winning with grace. I think many people was hoping the Seagulls lost because of Sherman. Way to go NE!! You should follow your own advice, Albert. This was a classless post. You just lost a reader. 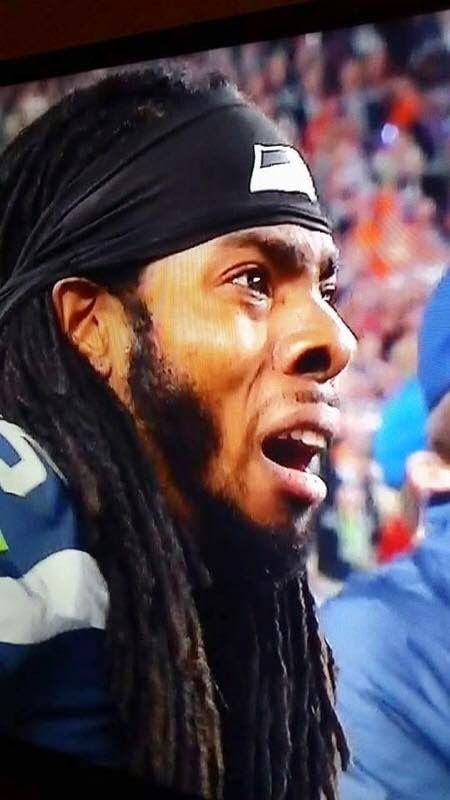 You do know Sherman was one of the first to congratulate Brady after the game? I am familiar with the whole situation and if somebody is offended by my post and they choose to not visit this site, that is definitely their right and choice. As far as Richard shaking Tom Brady's hand after the game, I think that is great but it does not erase his other previous actions. I would equate that to a bully shaking your hand after you finally stand up to him or her. I think Richard Sherman will learn from this and I believe we are going to see him act much differently in the future. I like Richard Sherman. He's a very intelligent guy who likes to play the heel, kind of like a pro wrestler. He is not a dirty player on the field, and I have no problem with his act in that context. Football is not the same as track. I will also note that the biggest trash talker in NBA history may have been Larry Bird, but with him, no one minded because he was just being "firey and competitive." His being white probably helped. Wow, someone's clearly butthurt that "their team" lost. LOL! The Seahawks are the equivalent of what the Oregon Project would be if Rupp refused to talk to the media, and Farah spoke out against IAAF policies and got into his opponents heads during races. Honestly, I'd like them a lot more! Posting this is hypocritical and shows that you are not the man Mr. Sherman is. You should put your niner bias aside and research to see who took the animosity between Mr. Sherman and your niners to a classless and disgraceful level, Mr. Sherman's words were "helluva game" after the INT in the 2014 NFC Championship game. Crabtree responded by shoving him in the face. Niner fans are bitter. How far they've fallen in 13 months. It's your site, but I'd have to say you were asking for trouble with this. I'm a fan of neither team, but I find most Niners fan's glee in the Seahawks demise as petty, and beneath such a storied franchise. Although I'd suspect Niner fan knows this is about all the satisfaction they may get in the near future. I also think there were plenty of bad apples here in Santa Clara to focus on without still blasting Sherman. Mr. Caruana, who are you to teach a lesson on ethics using an example from the NFL? This is way out of your lane. Richard Sherman is a Golden God! Gronk is definitely not a good example.